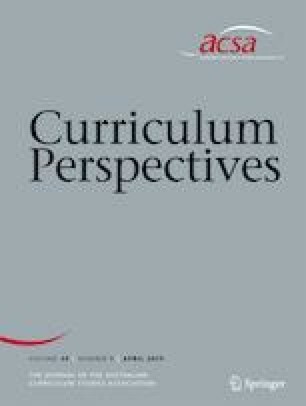 Australian Curriculum, Assessment and Reporting Authority (ACARA). (2011). Cross-curriculum priorities. Retrieved from http://docs.acara.edu.au/resources/Shape_of_the_Australian_Curriculum_Geography.pdf. Accessed 22 Aug 2018. Australian Curriculum, Assessment and Reporting Authority (ACARA). (2012). Information and communication technology (ICT) capability: Organising elements. Retrieved from https://www.australiancurriculum.edu.au/media/1074/general-capabilities-information-and-communication-ict-capability-learning-continuum.pdf. Accessed 22 Aug 2018. Hill, N., Witherspoon, D., & Bartz, D. (2018) Parental involvement in education during middle school. The Journal of Educational Research, 111(1), 12–27. https://doi.org/10.1080/00220671.2016.1190910. UNESCO. (2017). Education for sustainable development goals. Retrieved from http://unesdoc.unesco.org/images/0024/002474/247444e.pdf. Accessed 22 Aug 2018.